If your veggie plants have ants on them, it just might not be aphids that are the cause. Yesterday I found ants again on the Red Noodle beans up near the flowers even though I thought I had won the aphid battle with these beans. But a closer look revealed the real reason. There weren't any aphids. Apparently they’re after nectar. The peas and the Red Noodle beans are among 2000 plant species in more than 64 plant families that have these special little structures called “extrafloral nectaries”, meaning they are nectar producing bodies that are outside the flowers. The nectar is 95% sugar and the other 5% has a wide array of amino acids and other nutrients. No wonder all the flying things are having a ball! In the photo the nectaries are the small bumps with little pores in them, located on the stem right between the base of the flower buds. And the Red Noodle beans have them too. Ta-daaaa! Mystery solved. For sure these nectaries attract a pile of pollinators and beneficials. 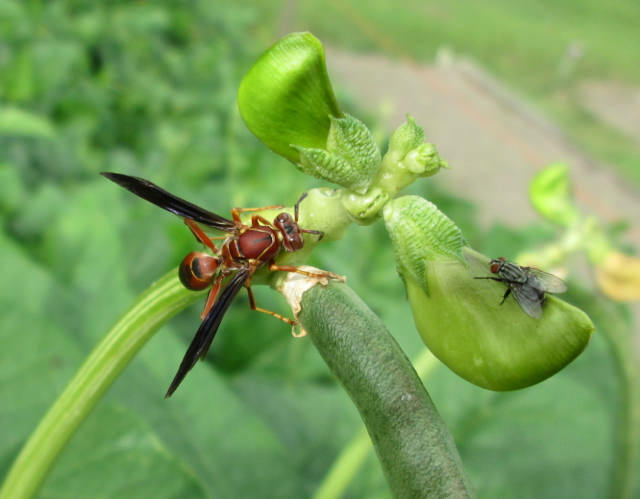 If you search “extrafloral nectaries” you can find lists of other types of plants that have these structures that make wonderful attractors of beneficials. Interesting. Thanks for posting this. This explains why there are ants on my sunflowers. I had no idea. Thanks! Super cool! Awesome pic and research! Thanks for sharing. Those extra-floral nectaries are one of the the main reasons that I grow so many yardlong beans. They attract wasps & ladybugs in large numbers. Both of those are voracious insect predators, that help to control aphids & caterpillars in my garden. Some who order ladybugs for their garden find that they just fly away; having yardlongs or cowpeas in bloom will provide a food source for the adults, and they will stick around. Then too, I just enjoy eating yardlong beans. Ants are attracted too, but to me they are just a nuisance. The wasps on & around the plants are unusually docile, as if they get drunk from the nectar; they will ignore my presence as I harvest (unless I grab one accidentally). The ants, on the other hand, are highly aggressive, and will attack anything which touches the plants... probably the reason that the plant developed those nectaries. The black ants, though, sometimes bring their aphid "cows" with them... usually the ladybugs will keep the aphids down to manageable numbers. Zeedman, you're so right about the number of wasps, bees and flying things attracted to these nectaries. The field pea patch gets covered with them. Happy pollinators! And they are docile. When I pick peas and there's a wasp on a pea I want, I just gently tap the stem the pea is on and the wasp lazily moves somewhere else. Just picked my first yardlongs yesterday, 'Red Noodle'. Fascinating! Thanks for posting this, I'd never heard of extrafloral nectaries before. Congratulations! Red Noodle is one of my favorites, for both color & flavor. My long beans this year are 3-Feet- Plus (pole) and Thai Soldier (bush?). This is the first trial for Thai Soldier, hence the question mark. They still have a long way to go yet before harvest, since I have to plant them so late here. Both varieties are very healthy though... we are finally having a summer with some heat. Last year was so cool, it was the first time all peas & yardlongs failed.